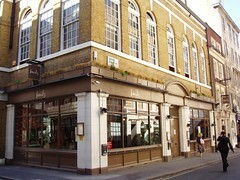 A former Hog's Head pub in Mayfair, now refurbished, though still nominally a sports bar. Inside this pub/bar there's plenty of space, on various levels. Seats and stools dot the upper bar area, with a mezzanine floor comprising a few tables and some banquette seating down a few stairs. There's a lower bar (and bookable function room) in the basement, down a few more stairs from the mezzanine. Decor is subdued, with low lights along the bar area at the back of the upstairs. TV screens show sport (and signs advertise major sporting fixtures outside), though the volume is off on Ewan's lunchtime visit in September. Instead, music is playing at a fairly low, but noticeable volume. The bar itself has two handpulls for ale, with London Pride (£1.65/half) and Bombardier. Other draught lagers are available including Staropramen and Beck's Vier. Draught cider is Strongbow. Food is served from a reasonable pub menu photo of menu in August 2009, including sandwiches, burgers and the like. Ewan's goat's cheese wrap (£6) photo also featured waldorf salad ingredients (grapes, apple and walnuts), and was served with coleslaw on the side: good, if perhaps overdoing the mayonnaise component. Chips were an extra £2, and there were plenty of them, fine and crispy. Last visited by Ewan, 2 September 2009. Last edited 2013-05-10 06:48:07 (version 6; diff). List all versions. Page last edited 2013-05-10 06:48:07 (version 6).